This is one of them. It is a convertible, which is also something I generally don't build, but it looks particularly nice. Interestingly, many of the kit makers who switched from cast metal to resin many years back were based in France. I say were for I believe most of them have since gone out of business. This particular one is by Record and is quite typical of the genre. The resin pieces usually have some flash, especially in the window openings, and they have pour stubs and mold seams that will need taken care of. The pour stubs are generally very small and included in the metal parts are bumpers, wheels, axles, screws to hold the underside to the body, exhaust pipes, and headlight bezels. Since this is a French company, the headlights are yellow clear plastic. A plastic steering wheel is included and there is a small photo etch fret with windscreen wipers. Additional resin pieces are wheel inserts and a cover for the folded top. Finding interior and exterior color information is truly not an issue as there are lots of photos on the Internet to help out. As you can see, the casting on the resin is actually very good and based on other kits I've built from Record, this one should be rather trouble-free and make a nice model. As you can see from the photo, Ferraris don't have to be red. 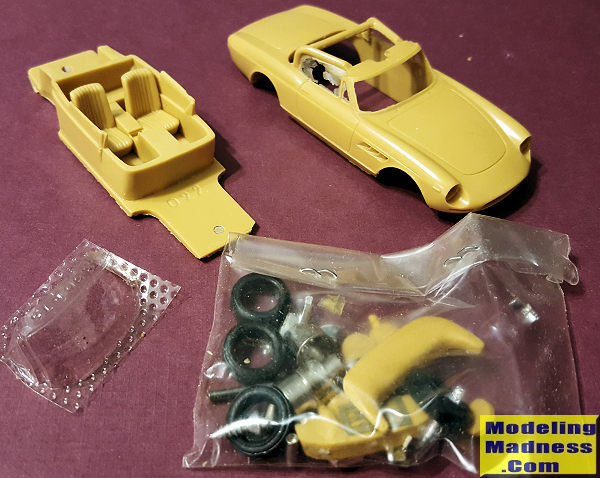 If you are interested in building a collection of exotic cars, would like to get involved in doing multi-media kits, don't want to spend a lot of money or take months to finish a kit, these would be well worth looking into.